This is a copy of the piece I wrote for The Limping Chicken blog (Deaf news and deaf blogs from the UK). I’ve been writing for 20 years, much of it alongside a day job, where I worked in Access Services at the BBC for 12 years (before that, I was a subtitler at ITV for 3 years), as a development manager, looking at and developing new methods to create subtitling and signed programming for the BBC output. I wrote in my spare time; one of my first broadcast script jobs was writing information films and sketches for BBC’s See Hear. In 2008, my son Toby was born and diagnosed with a severe bilateral hearing loss. It was an odd coincidence. After 15 years of working on programmes for Deaf viewers, I was raising one. The learning curve was steep. My family were immersed into a new world of British Sign Language, of hearing aids, of loop systems, of making sure everyone around you is deaf-aware. From 2010-2012, I worked with Deaf writers and directors, script editing three series of the Zoom and Zoom Focus strand for the BSL Zone, a compilation of TV movies and short films made entirely in BSL, which are shown on Film Four. This inspired me to write more deaf characters into my own scripts. I also wrote on two Zoom films, Chasing Cotton Clouds (co-written and directed by Samuel Dore) and Champion Of The World (directed by Bim Ajadi). In 2012, I wrote a television pilot called Snow Angel, which features a deaf police officer as the main character. I didn’t think it would appeal to anyone, as the majority of it was in BSL, but it ended up being a finalist in the Red Planet Prize and has since been developed as a six-parter with Noho Film and Television. Also, it landed me a chance to pitch on writing for ITV’s Vera. I wanted to put a deaf character into my episode. I also wanted an honest representation of what it’s like to be a hearing parent of a deaf child. The reality is that you just get on with it. You don’t stop to admire or reflect. That matter-of-fact portrayal of deafness appears to be on the increase in TV drama, which is a good thing. 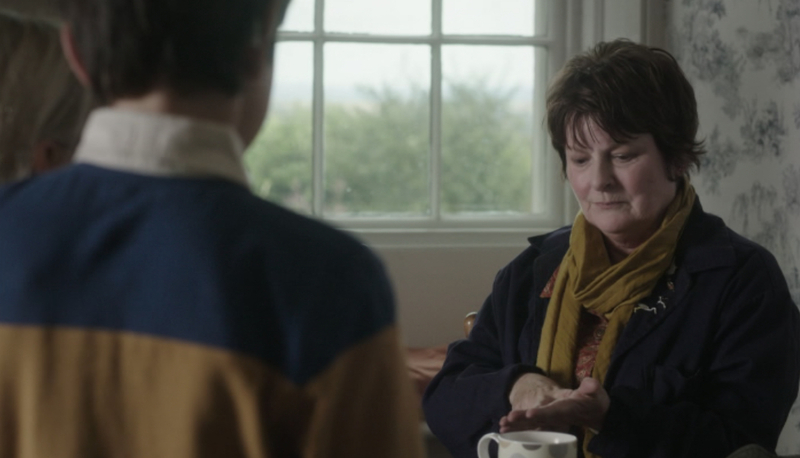 The cast and crew of Vera really embraced the deaf storyline. ITV searched local Northumberland schools and cast a deaf boy in the role. They had a sign language interpreter on set to translate and teach the actors playing the boy’s parents (Alex Reid and Mark Bonnar) some BSL. Even Vera gets to show off some of her sign language training, by finger-spelling her name (though she mistakenly spells it “Vira”!). I know one episode of a show isn’t going to change the world, but the more exposure that deaf characters get on television, the more viewers will get a flavour of that wonderful world. And for me, on a deeply personal level, that increases the chances that deaf children like my son will experience less ignorance and more acceptance as they grow up. You can watch this episode of Vera on Sunday night from 8pm-10pm on ITV1. Tagged ITV, Script, Vera, writing.